or wood skewer - you could use tweezers. 1. Turkey Flat feathers have a fine, straight rachis or spine and can be purchased at fly-tie shops or on the internet. You would not normally find these feathers at a craft store. 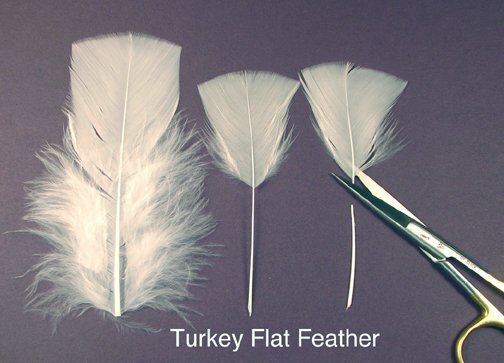 This photo shows a white turkey flat both before and after stripping away the lower part of the feather. Before dying, I will always strip away the "lower downy part". 2. 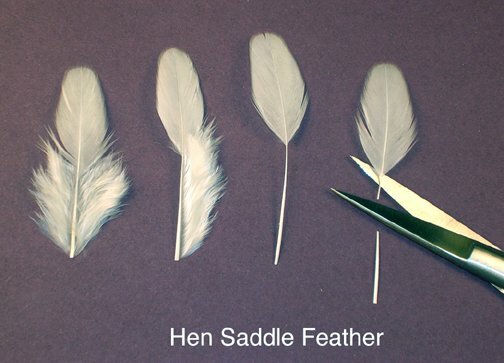 Hen Saddle feathers are exceptionally good for making small miniature birds. These feathers have a hair-fine rachis or spine, and have a greater density of web and velvety texture. Hen saddle feathers are sold attached to a small section of chicken hide/skin and contains literally hundreds of feathers. You can find these feathers at most fly-tie shops or on the internet. You would not find hen saddle feathers at a craft store. This photo shows a white hen saddle feather before and after stripping away the lower part of the feather. It's a good idea to strip away the "downy" portion of the feather before you dye it. NOTE: Most purchased feathers have been thoroughly washed in an inert detergent before they are packaged for retail. If however, you wish to wash your feathers, make sure you use a mild soap like Wooliteï¿½ brand or similar. After washing them - thoroughly rinse and set them on a paper towel to "air dry". DO NOT dry your feathers in a dryer. Feathers have a natural oil and you do not want to "strip" the oils completely from the feather otherwise it will become brittle. 3. Put on your rubber gloves - you do not want to get any of this dye on your hands. 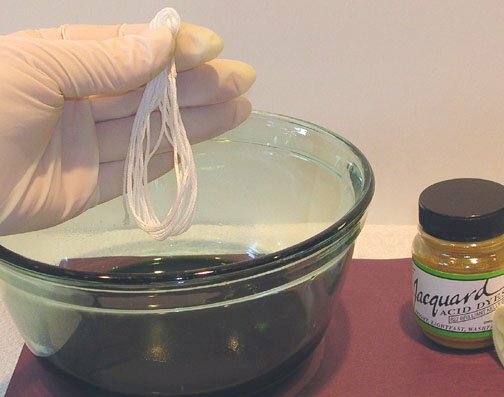 In a small bowl, mix ï¿½ cup warm water with 1/8 teaspoon of Jacquard Acid Dye. 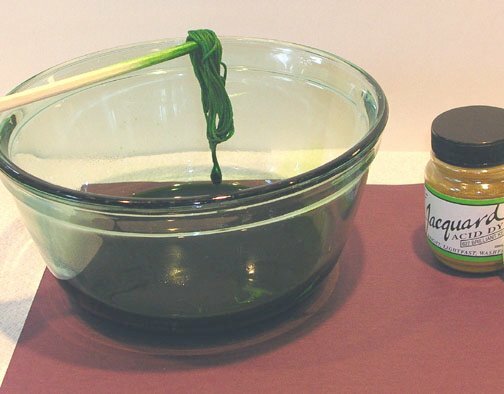 Stir with your chopstick or wooden skewer until dye & water are mixed well. 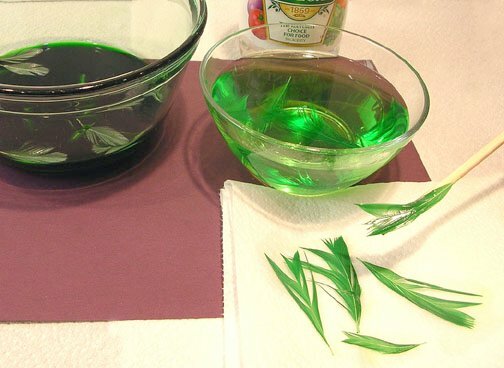 Take your feathers and drop them into the bowl of dye. 4. 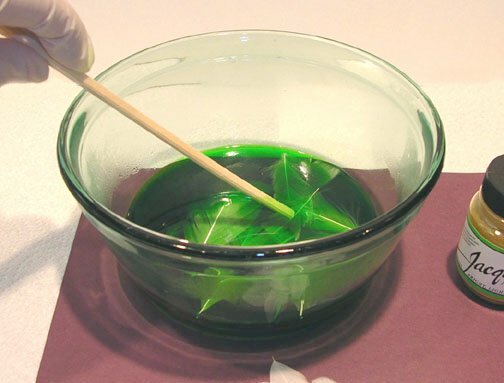 Take your chopstick and push the feathers under the colored dye water. Some of your feathers may want to "float" because of the oils - just keep at it and make sure that they are all good and wet. 5. Next you want to place your bowl of dye and feathers into the microwave. Before you place into the microwave - cover the top of the bowl with a paper towel (this will catch any tiny dyed-water splatters from coating the inside of your microwave oven). Place the covered bowl into the microwave and bake for about 1ï¿½ to 2 minutes. 6. Use caution when boiling in the microwave - some ovens will boil faster than others, etc. 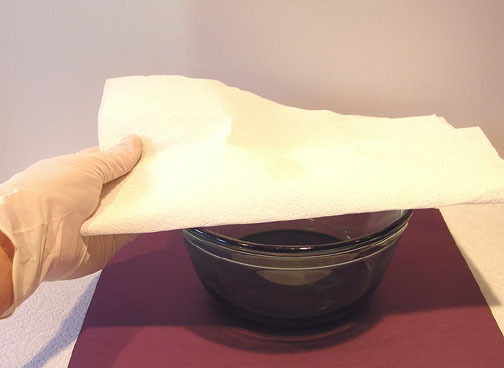 When the 1ï¿½ to 2 minutes is up - carefully remove bowl from microwave (the glass bowl may be extremely hot) and set on a flat, paper-toweled surface to cool. 7. You can also dye some thread at the same time to match your feathers (if you are making miniature birds with feather & flock). 8. I suggest that you use a 100% cotton or silk thread for best results. 9. 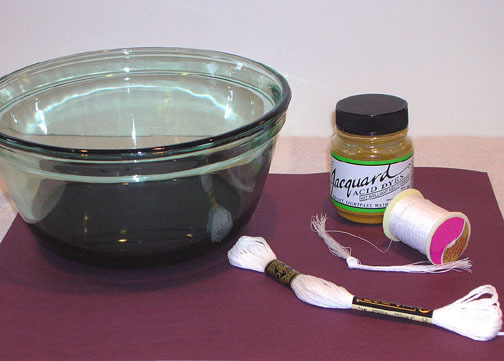 After you have dunked your thread into the dye-bowl, continue to follow the remaining steps (the same as for feathers). 10. Prepare your rinse bowl. Mix 1 cup of cool water with 2 tablespoons of white vinegar - stir. 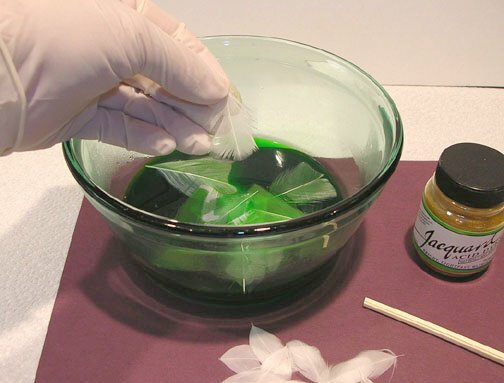 After your feathers or thread have cooled down, you can remove them from the dye and into the vinegar rinse water using your chopstick or wood skewer. Swizzle them around in the rinse water. You will see some of the color rinsing off into the water - that's o.k. 11. Using your chopstick or wood skewer - fish your rinsed feathers or thread from the rinse water and unto a paper towel to drain. Let them air-dry naturally. 12. After your feathers have air-dried, they might look a bit "ragged". Feathers can be smoothed back into shape by gently holding the spine in your hand and stroking the "vanes" with your thumb and fingers. The vanes should work back into shape and become smooth. Some feathers can be a bit stubborn, just keep smoothing them out. 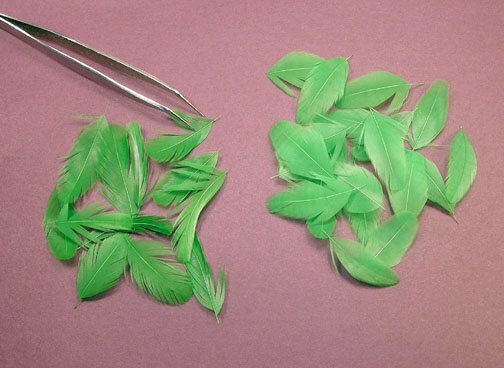 The photo is of BEFORE and AFTER dyed feathers. As you can see the feathers on the left don't look as fluffy or smooth. The feathers on the right have been "smoothed" using my fingers. IGMA Fellow Kerri Pajutee is a self-taught artist, that finds sculpting animals a pleasurable and challenging hobby for over 30 years. Kerri says she balances her life and hobby with wonderful, supportive family and friends. As a result, she creates her miniature animals on a part-time basis. Kerri says that this arrangement keeps her sane and her sculptures fresh and enjoyable. Kerri is a valued member and Moderator of the Animal board in the CDHM Forum and has a CDHM Gallery available, just click here.